Quidditch begins next week!!! Isn't it crazy? Seems like the last round just ended. Time is just clipping along. Make sure that you are all prepared. Visit your housemates, leave notes on their blogs, create a flurry so that everyone knows it's coming soon. The questions will be released on Monday morning - approximately 10 AM PST. The Snitch will be released on Wednesday, also at about 9PM PST. This bunch, honestly, has been the best about your participation and posting on a weekly basis. I really think that the character blogs have added to the excitement of the swap. That and the Common Rooms. Make sure that everyone in your Houses posts this week also! Especially if they did not post last week. Madam Pomfrey has returned to her usual post and is quite healed from her ailments. 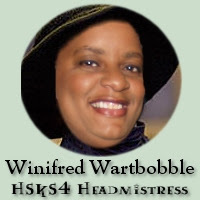 I'm sure that many of you that had to visit the infirmary while Hagrid oversaw it is relieved to her of her return. Professor Humperdink has gotten used to his post as the new DADA teacher, but it appears that he has heard of some of the nightly visits going on within the castle and has become insanely jealous!! Hmmmm . . . who could he be jealous of? Does he have a romantic interest that I did not know about? Yikes!! Snitch will be released on Wednesday!!! While I'm at work?? Yep, we must mix things up a little, but this one will be released Wednesday evening. Oh yeah!! In the evening. Duh!! Looks like it's time for me to catch up and do a little blog hopping tonight!! I work nights and can't get to the computer on weekends. So far no chance at all of being able to catch the snitch for my house. Maybe a snitch release during the day during the week sometime??? Please bookmark this site and come back for the next one near the end of May 2008. Look for us on Ravelry!! Add Your Kit Photos to Flick'r! Earn 5 House Points when you link to this site from your blog using the logo. The Snitch has been found! Got a Snitch? Post here!! Used Swap-bot for Sign Ups and it was a disaster! Note: Swap-bot is not good for complex swaps. Follow up not very good. Kept no record of bad swappers. I supplied all prizes for Quidditch. Began Sign-ups a week before the first swap ended because I was going on a trip and needed to fit the swap in before I left. Changed from swap-bot sign ups to using a Bravenet form. Still lost some registration forms or some of the form information was missing and I had to do a lot of back-tracking. Only 2 Quidditch matches because of the shortened swap time. Follow up still terrible. Prefects a big part of any follow up that was accomplished. No Angel Package program. 1 person banned because they didn't fulfill the swap. Ran from end of September '07 until Oct. 31st. Used Bravenet forms again with same result from HSKS2. Enlisted the help of Angels for the first time. Follow up still not very good. Prefects a big part of any follow up that was accomplished. 1 person banned because they did not fulfill the swap. I supplied most prizes for Quidditch. I had help from 3 swap members for two of the prizes. Took a 2 month break from HSKS3. Running from Jan. 12 - April 4, 2008. Registration strictly through email. Simplified my world immensely! Updated my database to include posting follow up, ability to donate, bounced email notifications, banned swappers from previous swaps, delivery confirmation numbers, date packages were sent/received. Swap member decided to blog in character, so many participants followed suit. Character blogs have helped spread the frenzy. Stricter guidelines on weekly posting. Used demerit system for the first time. Created Common Rooms for chatting with huge success. Wrote the Daily Prophet for the first time to keep swap members informed. Well received. First time requiring delivery confirmation receipts. Changed form to ask for prize donations and only 38% said that they could not help out with prizes.